According to trade bible WWD, Asim Abdullah, owner of Ungaro, was lunching in Paris with Brit designer Giles Deacon. To no one’s surprise, the House parted ways with celeb/gal about town/artistic director Lindsay Lohan after a dismal design debut in October. It could be a wonderful collaboration – just compare these looks from Deacon’s presentation at the V&A last year, showing pieces from throughout his career with these from the Ungaro archives. Not copies by any means, but you can see that the sensibilities that Monsieur Ungaro possessed while designing (he retired from the house in 2004) are important to Mr. Deacon as well. It’s all there in black and white – just look at the graphic print and deep v-neckline border that runs down both dresses. Large prints and muted tones show up in both looks here, although both prefer bolder colours. 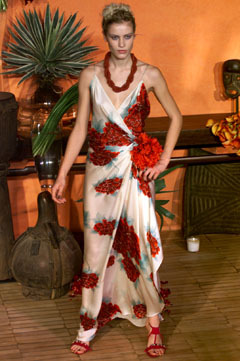 If I were to use one word to describe an Ungaro collection, floral might be it. Interesting how Deacon has mixed the muted tones and such a structural cape but softened it with a larger floral print. Deacon’s version is slightly more devilish. 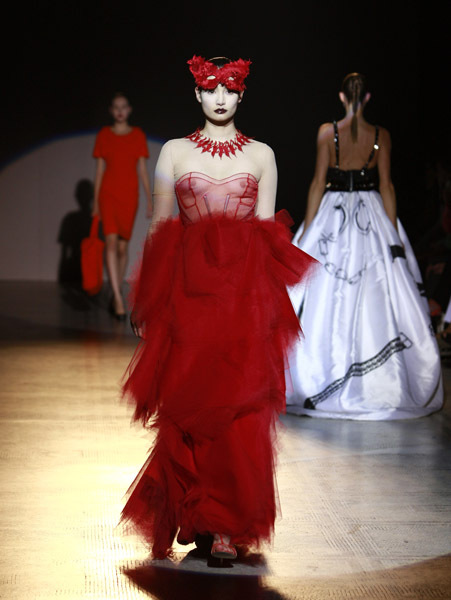 While not exact, both designers play poetically with the drapes and folds of fabric – and red adornment. Both designers dress women but almost always, prefer ladies. The colour of the suit, the skirt length and the print on the blouse is uncanny. See the remaining images from the Fashion in Motion presentation at the V&A last year. Deacon images courtesy of RDuJour. Ungaro images courtesy of Style.com.